In 2012, I wrote about becoming a detective to your own experience and what kind of eggs you like (and who you really are), but this week I want to take it a bit farther. What do we do, when we don’t know what to do? Who might we be, if no one ever told us who to be? What do we like to do for fun? What lights us up to a point where we are grinning from ear to ear and giggling with wild abandon? How do we know what we want for ourselves? 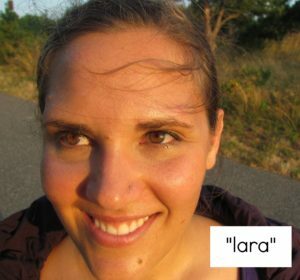 Let me tell you a little story about a girl named “Lara.” Lara is pretty smart and funny – when you get her attention. However, quite often, she can be found with her phone or computer attached to her finger tips – while she “checks in” with her business. She works evenings, weekends, in the middle of the night – you name it. She works, because when she is working, she feels deeply useful and deeply of service to others. When she is working, she knows exactly where she stands and it feels good. Like a messy finger painting on a paper taped to the table, her work spills over the edges – reaching as far as the eye can see. She tells herself – we are having FUN, this is what FUN looks like. She tells herself, this is the kind of person that you are, a worker. She uses her work here as a shield to guard herself from the aspects of her life where she is far less certain – socially situations, time spent with her sweetheart, and, especially, when asked to fill hours with exciting adventures and things that she genuinely LOVES to do. While this story is mine, it mimics the pattern that I have been seeing with many of my clients – that of taking on drudge work or other tasks during our allegedly relaxing down time, because we aren’t quite sure what else to do to fill the day. We do what has been asked of us or what is expected of us, because there isn’t any preferable alternative. We find ourselves complacent in our lives – because, truthfully, it isn’t all that bad. We find ourselves stuck in all manner of situations that are a far cry from what we might build ourselves or attract into our lives if we had an opportunity to start again. We shrug and trudge along, because it seems like it requires less effort than creating an entirely new narrative for ourselves. We check our email, because it makes us feel useful. We stay glued to our Facebook feed, because we are deeply craving a social connection. We add things to our to do list, because we thrive in productivity. We stay away from home, because our homes don’t reflect or relax us. Here’s the thing – you are so much more than what you do. You are a gorgeous compilation of wild dreams, radical adventures, unique ways of doing things, and fantastic hopes for the future. You are unlike anyone else that you know. On your own path – you are an intrepid traveler with all of the know-how and exuberance that you need to cultivate a life that is tailor fit to you. You have all of the tools to decide that this is the exact moment that you are going to reclaim your life. Every second is a second to make a choice that is steeped deeply in having your best interest in mind. How would you do it if no one ever told you how you should do it? What would you choose if you had your heart set on making yourself fantastically happy? Whip out a fresh piece of paper and begin writing down every single thing that you can remember ever wanting to do. Snorkeling? Learning how to walk in high heels? Starting an organic vegetable garden in your back yard? Writing a novel? Write it on the list. Keep that list handy. Allow for your dreams to begin to dance around the periphery of your daily life, insidiously lighting you up whenever you think about them. Add to the list whenever you come up with new dreams, tasks, adventures, or activities. Yes yes yes! This is like exactly what we talked about over the summer during lunch that time – kind of being stuck in that “but i don’t KNOW what I want to do” before even doing it. Thank you for the concrete advice at the end – I will make this a project this weekend. And thank you for bringing this conversation to light!